A deputy and a bystander injured in a shootout with a gunman near Sacramento have been released from the hospital. Sacramento County sheriff’s department spokesman Sgt. Shaun Hampton says Deputy Julie Robertson and the unidentified bystander were released on Tuesday. Robertson’s partner, Deputy Mark Stasyuk, was shot and killed when the officers responded to a call about a disagreement at an auto supply store in Rancho Cordova on Monday. The suspected shooter was apprehended following a second shootout with other responding officers. Hampton earlier Tuesday identified the alleged gunman as 38-year-old Anton Lemon Moore of Rancho Cordova. He says Moore remains hospitalized. Authorities have identified a 38-year-old man accused of shooting two Sacramento County sheriff’s deputies. The sheriff’s department said Tuesday that Anton Lemon Moore of Rancho Cordova is hospitalized after being shot multiple times during a shootout with deputies Monday. He’s also known as Anton Lemon Paris. Sheriff Scott Jones says Moore shot at deputies when they responded to a routine call about a conflict at an auto parts store in Rancho Cordova, just outside Sacramento. Twenty-seven-year-old Deputy Mark Stasyuk was killed and 28-year-old Deputy Julie Robertson was shot in the arm. Robertson is expected to recover. The sheriff says Moore was captured after a shootout with two other deputies nearby. The sheriff’s department says a bystander who was hit in the crossfire is stable but remains hospitalized. Flags at California’s Capitol are flying at half-staff after a Sacramento County sheriff’s deputy was killed and a second wounded in a confrontation at a Pep Boys store. 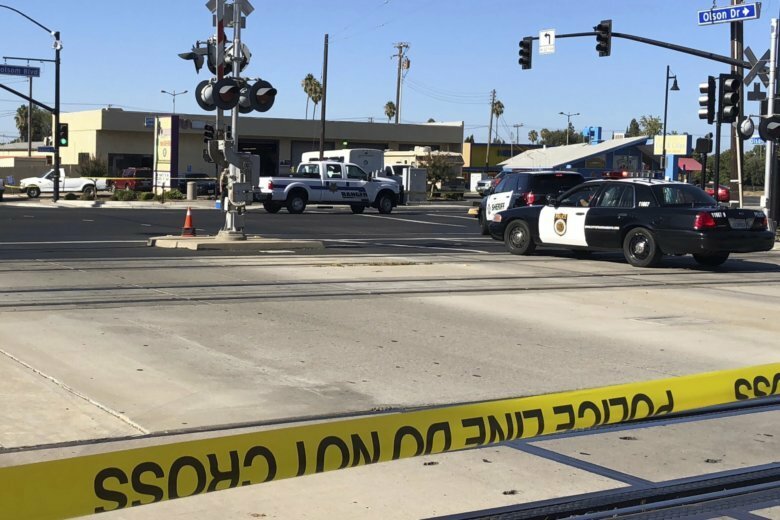 A bystander and the suspected gunman also were wounded in Monday afternoon’s shootout at the auto parts store in Rancho Cordova, just outside Sacramento. Authorities say deputies were answering a report of a dispute between a man and a store employee when, without warning, the suspect opened fire. Twenty-seven-year-old Deputy Mark Stasyuk was killed and 28-year-old Deputy Julie Robertson was shot in the arm. Sheriff Scott Jones says the suspect and the bystander are expected to survive. Their names haven’t been released. Stasyuk had been with the department for over four years.